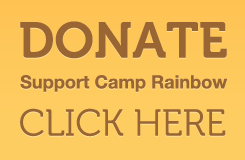 It has been another amazing day here at Camp Rainbow! We played our 15th Annual Sandra Davis Memorial Softball game this morning and our results were as usual….. the Dog Pound (campers and staff) beat the Rainbow Rockets (counselors) by a long shot. The score, 13-0! Way to go Dog Pound. You make us proud! This afternoon we started making some BIG steps! The stepping stones are setting now and they look wonderful! The craft of the day was a fish bird house! The kids are having so much fun decorating them. I know you can’t wait to see them when they bring them home. Kids are also being very diligent about starting their pinewood derby cars. There are some really cool cars being made. I think someone is making a spaceship car. Can’t wait to see them all! Today was the day that almost everyone went to the lake inflatables! So many kids were playing on them that I could hear them laughing all the way at the activities building. At the lake we have an inflatable trampoline, the NEW Aqua Glide and of course the pontoon boat. I even saw one of the kids driving the boat. Everyone watch out! To say the least we have had a really exciting day thus far. But it’s that time again to say goodbye. There is a hot air balloon here and I can’t wait to go take a ride. But before that, I’m gonna go make me a s’more by the camp fire! Until tomorrow…..